Perfect costume for male adults to cosplay walking dead doctor! 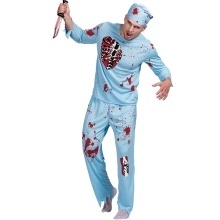 Bloody walking dead doctor costumes, suitable for male adults. Including a top, a pair of pants and a hat. Perfect for Halloween, Cosplay, themed party, stage performance and more. 3. The knife is not included.